And thus brings the end of writer Al Ewing’s first volume of the Ultimates, which is scheduled to continue next month with the first issue of volume 2. The Ultimates is easily the most epic and most creative of all the All-New All Different Marvel titles, and not one issue is short of excellence. That doesn’t mean it’ll be for everyone – it’s usually more about exploration and solving problems. In some ways it’s like a classic Fantastic Four run, just without the actual Fantastic Four. This issue ties into Civil War II, but it mostly tells its own story while setting up volume 2 of the Ultimates. 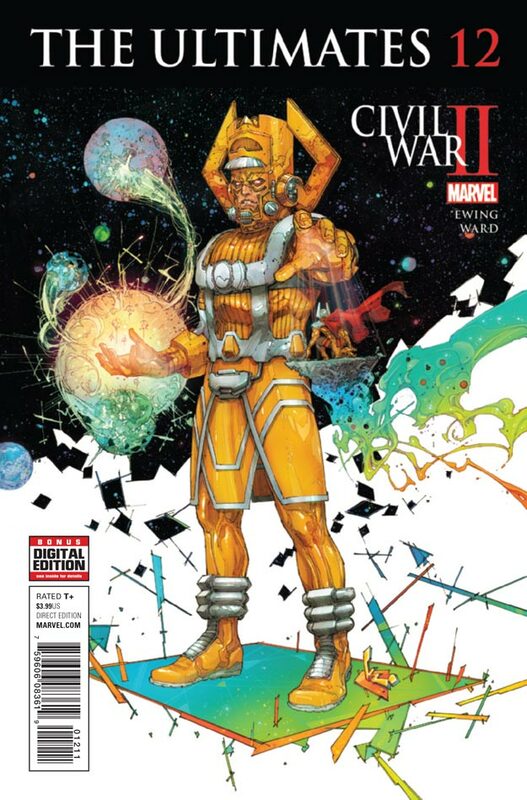 It both opens and closes with Galactus, who became the Lifebringer in the first few issues. Long story short, he creates his first herald of life and talks about an upcoming war that he’ll need help with. The rest of the comics focuses on the internal shattering of the Ultimates team, mostly caused by the Civil War. Unlike Captain America 6 this week, this issue doesn’t flashback to the event, but it does acknowledge Black Panther publically switching sides. There’s some good political build-up for a potential rival team in the second volume, and there’s a great moment where Carol travels with Ms. America to an alternate dimension where Dr. Doom is using Ulysses’s powers to dominate the Earth. That moment acts as a fun action scene and a good character moment for both of them. Even though they disagree heavily on the Civil War, they can still get along if need be. It’s also a moment that could help Carol’s point of view balance itself out better, if it’s referenced in the main event at all. With only 2 issues to go and such a slow pace, I doubt that it will. Christian Ward handles all art and colouring duties, and it’s a bit mixed. On the downside, body proportions often look slightly off, although facial expressions do a great job at conveying a wide variety of emotions. The cold stare Ms. America gives Captain Marvel when they first meet up is particularly good. The background detail in the alternate dimension is great with its mix of graffiti on the walls, damaged buildings and strongholds that declare themselves as future disaster zones. The art in Galactus’s scenes however are bright, colourful and artistic looking in all the right ways. In short, many of the panels are mediocre, but some are brilliant. This is a great issue to conclude a brilliant series. If the teasers are anything to go by, the next volume should be every bit as good as this one, although there will probably be a bit less exploration and more action. That’s not necessarily a bad thing, but I hope it’ll keep some of the unique aspects that made Ultimates such a great series. In any case, both this issue and this series as a whole is an easy recommendation for Marvel fans in general. This entry was posted in comic, comic review and tagged al ewing, all-new marvel, black panther, captain marvel, carol danvers, christian ward, civil war II, comic review, comics, dr. doom, event comics, galactus, marvel civil war, marvel comics, ms. america, ultimates, ulysses. Bookmark the permalink. I loved this. A nice, quiet, character-driven issue. Lots of really nice Carol stuff. And some great work with America. That stuff was so good. I love America, and seeing her and Carol remain friends is really great. I love that there’s no animosity between them. They disagreed, America hit her with a chair, but they both think too highly of each other to hold a grudge.